Discussion in 'Stock 2011 - 2019 Ford Explorer Discussion' started by baxterdown, June 21, 2011. 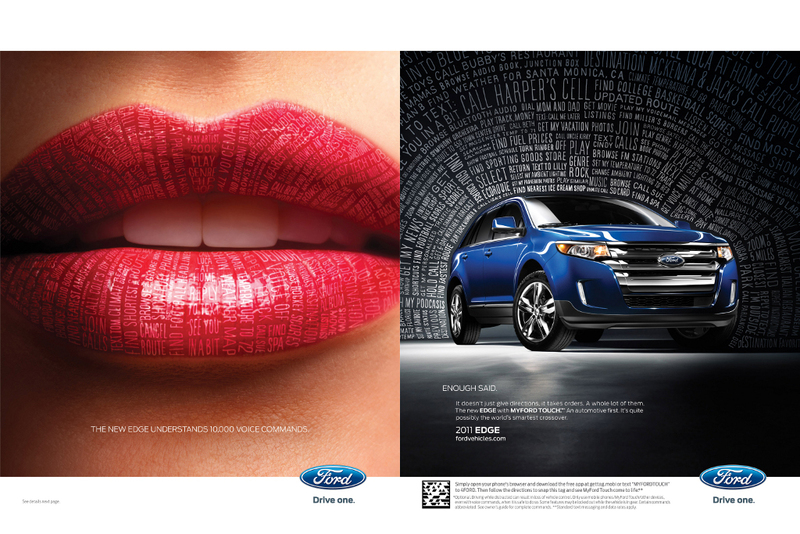 So, you’ve probably seen the Ford Edge “Tech-Savvy” print campaign. If not, click here. Well, I decided to put it to the test. OMG! WHAT A JOKE!!!! LOL!!! Here are some of the commands the ad claims MFT is capable of understanding. Yeah, right. NOT A SINGLE ONE of the commands above works. No matter which device I was on, how I said it, etc. All they did was get MFT more and more confused. It seems that “search, “find,” and “browse” are completely unknown terms to MFT. “Over ten thousand commands…” aha, sure. To be fair, I think some of this functionality exists, just not with those commands.... In the fine print - VERY TINY - it says "see owner's manual for complete commands" !!!! I interpret that to mean "we've summarized the commands." Although, I'm fairly certain that you cannot change the ambient lighting with voice commands or do some of the other stuff in the ad. Although I definitely do agree with your conclusion that the ad is misleading. I would like a clarification from ford on what they mean bt 10,000 word recognitions. We all know after using the mft and sync that you have to follow a strict structured protocall when using voice commands or else they wont be recognized. There advertising is grossly false and misleading to potential buyers. I actually went out and verified that all the commands in the youtube video work (except the climate commands). The only difference is that on my Ex, when I say "find icecream" (or a different POI) there is an additional step where it pops up a list of POI categories which it thinks matches (instead of just going right to ice cream). The POI categories it pops up are fairly accurate with ice cream parlor among the choices (along with grocery stores and other food related POI categories). As soon as I say "Ice Cream Parlor" it shows me a list of the nearby ice cream parlors. I tried it as well with "find electronics store" - it popped up some shopping POIs including electronics stores. When i specified electronics stores it showed me BestBuys, Radio Shacks and the like in my area. I also used "find an address" - and it found it right away. It was actually pretty slick! "Call Joe Dirt" works from any source. "set temp seventy five degrees" only will work when preceded by "climate" and waiting for the next prompt"
"get directions to home" only works after the prompt "services"
"tune to one hundred point seven" only works after the "radio" prompt unless you are already on the radio. Natural speaking works great for me. The learning curve is there as it is with any technology. When a command doesn't work...it's not going to work the next time you try to use it either. Besides, if you are bored...you can always say "what can I say?". "I'm hungry" works as well. Finds places to eat on the NAV. SYNC must not have understood me. I tried that and got a bunch of questionable massage parlors. Wow! That's one advanced system!